Given the pressures on the news industry, it's not surprising that Brooklyn Paper publisher Ed Weintrob might have put his weekly newspaper chain on the block, and it's not shocking that Rupert Murdoch's News Corporation, which already controls the Courier-Life chain, might have decided to make the purchase, as the New York Observer reported yesterday. What is surprising--brutally weird, actually--is that Brooklyn Paper editor Gersh Kuntzman, a New York Post alumnus would tell the Observer, "They don’t want the product to change. And they love the product. And the product is fantastic." Well, um, why wouldn't the News Corporation seek, as they say in the biz, efficiencies and synergies in Brooklyn news coverage and ad sales, given that both papers publish editions for neighborhoods like Park Slope, Brooklyn Heights, and Fort Greene? (There are areas with less overlap.) DDDB calls it Monopolyn. For how long will two reporters compete to cover the same story for two competing newspapers owned by the same giant corporation? Brooklyn Optimist blogger Morgan Pehme already reports that consolidation has begun, with some staffers and the Greenpoint Courier getting the ax. The Courier-Life chain recently moved from Sheepshead Bay to rent space in Forest City Ratner's MetroTech. Will the Brooklyn Paper, now headquartered in DUMBO, be consolidated into the same space? If so, it might make it tougher to report critically on Brooklyn's most powerful developer. Now Mr. Kuntzman, a former New York Post reporter, will be back working for his old boss, which may or may not be a great thing but definitely beats unemployment. Maybe the "voice that's Brooklyn to the core" (in Newman's words) will be preserved, but I have some doubts. The Brooklyn Paper has always been more of an outlier. In fact, Kuntzman told Gothamist a little more than a year ago, on 2/11/08, "Brooklyn needs us too much right now, what with local papers being snapped up by billionaire moguls who have no interest in local news except maximizing classified ad sales. Has Rupert Murdoch even BEEN to Brooklyn? His reporters don't know the territory, either." The untimely loss of Gowanus Lounge founder Robert Guskind weighs heavily; not only would Guskind have offered some acid commentary on the consolidation, he would have been in the forefront of efforts to maintain independent reporting on the borough. Will the Brooklyn Eagle, which focuses on downtown, step up? Will the Brooklyn Downtown Star, part of the Queens Ledger chain? I doubt it. Both Pehme and OTBKB's Louise Crawford think local blogs will become more important. Brownstoner currently has a significant readership, more than the web sites of the major Brooklyn weeklies, and generates many comments, but essentially aggregates others' reporting, along with other information (press releases, etc.). Perhaps when the market recovers, Brownstoner will be able to restore the second staffer lost. I don't doubt that blogs will become more important, but online journalism ideally should be an institution--say, a New Haven Independent, an online newspaper run by Paul Bass (a friend)--that can aggregate readers, distribute news tips, and maintain quality. 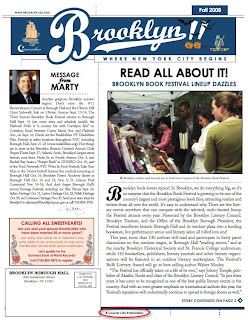 Brooklyn needs such a publication, a Voice of San Diego or a MinnPost, a nonprofit organization dedicated to reporting. Over the last 12 months, no story has been as important to Brooklyn — and, as a result, to this newspaper — as Bruce Ratner’s Atlantic Yards mega-development. With its 16-towers, 19,000-seat basketball arena, 6,000 units of housing and hundreds of thousands of square feet of office and retail space, Ratner’s mini-city is the biggest single-developer project in the history of Brooklyn. As such, it deserved — and got — our attention, sometimes obsessively so. As we prepared our year-in-review issue, we noticed that not a single issue this year was devoid of coverage of some element of the Ratner proposal. Yet our laser-like focus has earned us little praise and sometimes even outright scorn from local elected officials. In an interview in this week’s Papers, the project’s biggest booster, Borough President Markowitz, calls us “biased” because our coverage revealed the shocking density of the project, the traffic it would cause, and the subsidy-enriched sweetheart deal Gov. Pataki’s cronies cooked up in Albany to make this project work for Ratner. Given how we’ve been attacked for such coverage — and the overwhelming support the project enjoys among city and state powerbrokers — many of our readers have wondered why we even bothered. Indeed, it would have been far easier for us to blow off Atlantic Yards, as did the daily papers, and our weekly competitor, the New York Post-owned, Sheepshead Bay-based, Courier-Life chain. Let's assume that the Brooklyn Paper will be less likely to slam the Courier-Life chain, which, it should be pointed out, editorially supported Atlantic Yards before it was bought by Murdoch. Will the Brooklyn Paper point out again that a Courier-Life reporter--the one who recently cast Bruce Ratner as a victim of project opponents bent on denying him stimulus funds--gave Ratner a bear hug? 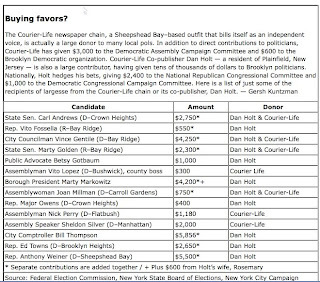 Will the Brooklyn Paper again target Courier-Life publisher Dan Holt (and former Chamber of Commerce chair, still an ex officio board member), as it did 8/5/06 in the pre-Murdoch era for contributing to political candidates? (See graphic above; click to enlarge.) Probably not, though Holt remained at the paper and, as the graphic below indicates, has made another dozen contributions to candidates since then. Will the Brooklyn Paper maintain its tough coverage of Atlantic Yards? Well, it's already receded somewhat. 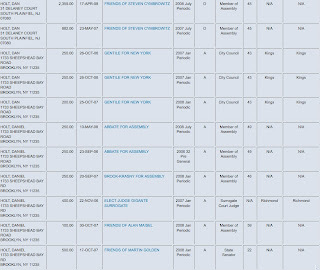 Has the Brooklyn Paper covered Delia Hunley-Adossa's AY-related challenge to Letitia James? Not yet. Is that because the newspaper is less aggressive or just shorthanded? Was Weintrob's shocker of an editorial last month calling for a federal bailout of the AY arena related to an effort to sell the paper, to make it's AY position more palatable? I still doubt it, but there's a whiff of a question. Brooklyn still needs The Brooklyn Paper, which is why one of the only people in the world who still believes in newspapers — Rupert Murdoch — is putting his money and genius behind us. To be fair, Murdoch didn't dumb down the Wall Street Journal after he bought it. He did refocus the front page, and some even see improvement in the breadth of coverage. But the Journal is an elite paper, not a free one. I suspect the Brooklyn Paper will continue to do some good work, but will it go after politicians and other powers-that-be in the same way? Some convergence with the Courier-Life seems inevitable. Thank god this happened. Now there is no longer a pretense of coverage, let alone quality coverage of Brooklyn. Brooklyn lost the Dodgers and got the lowest level minor league in return. Now it is being promised something that is a fading image (Nets). Brooklyn lost its paper(Eagle) and got the courier/brooklyn papers contraption. Neither one of them spoke to any real issues or did right by Brooklyn. Maybe Brooklyn has paid its dues and will create its own answer. I'm tired of waiting for others. Its time Brooklyn got a grip and refused mediocrity. Thank you Rupert. You may have forced our hand. Nice piece. You ask a lot of questions in it. Pity you didn't call to seek the answers. Kuntzman is kidding himself if he thinks that "They don’t want the product to change. And they love the product. And the product is fantastic." Less than a year after Murdoch bought the Wall Street Journal Marcus Brauchli (editor and long time employee) was out. That's the way he operates. Gersh, I started writing this at about 11:30 last night. I chose not to wake you up. You're welcome to post additional comments, and I'm happy to link to future coverage. Please let us know if you are going to call out Dan Holt on his political contributions? Maybe if Brooklyn could revoke the "Mistake of '98," and cut itself off from its Nanny State Manhattan, we can stop being the punching bag of the city. We can get a real newspaper, a real baseball team, a real transportation system, or whatever else a real city might decide to acquire. Heck, if they want to charge us to cross our own Bridge, then maybe Brooklyn will be the one collecting the toll. Then we could kick Ratner and his Tammany friends the hell outta here. seems to have expanded its coverage. I've read a lot about Gowanus, Bay Ridge, Sunset Park over the past year.